Chicasaw plums (Prunus angustifolia) can be found in powerline rights-of-way, abandoned agricultural fields, and other mostly treeless, sandy areas around SRS. The colorful fruit is eaten by a variety of wildlife, and is edible to humans—usually in the form of sauces, pies, preserves, jams, and jellies. 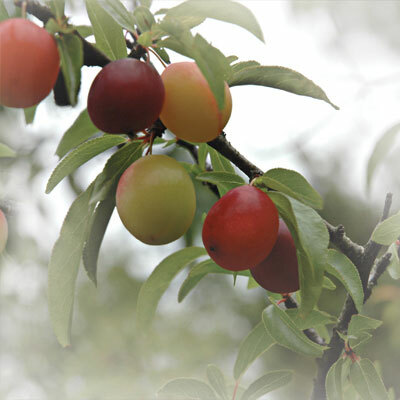 Chickasaw plum shrubs typically form dense thickets that provide valuable shelters and nesting habitats for birds. The 2010 SRS Environmental Report cover photograph was taken by Al Mamatey of Savannah River Nuclear Solutions’ Regulatory Integration & Environmental Services Department. The report's interactive CD and associated web pages were created by Marvin Stewart of SRNS's Information Technology Department. The cover and CD label were designed by Eleanor Justice of the company’s Records and Document Control Information Section – Information Management and Program Support Group.